I pick up the stitches as usual, except for the last one. 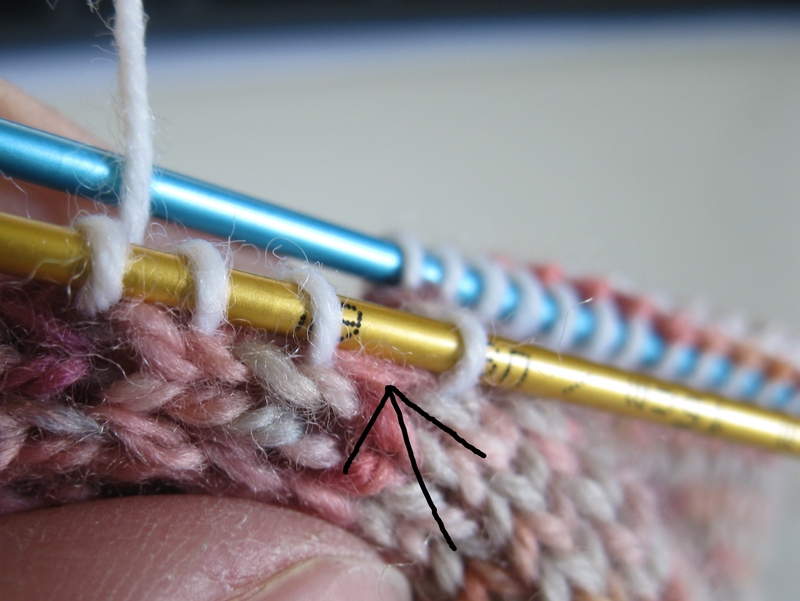 For the last one, I skip the selvedge stitch and look for the regular stitch in the row below – see the beige one with the circle. See? That’s where you want to pick up the last stitch. 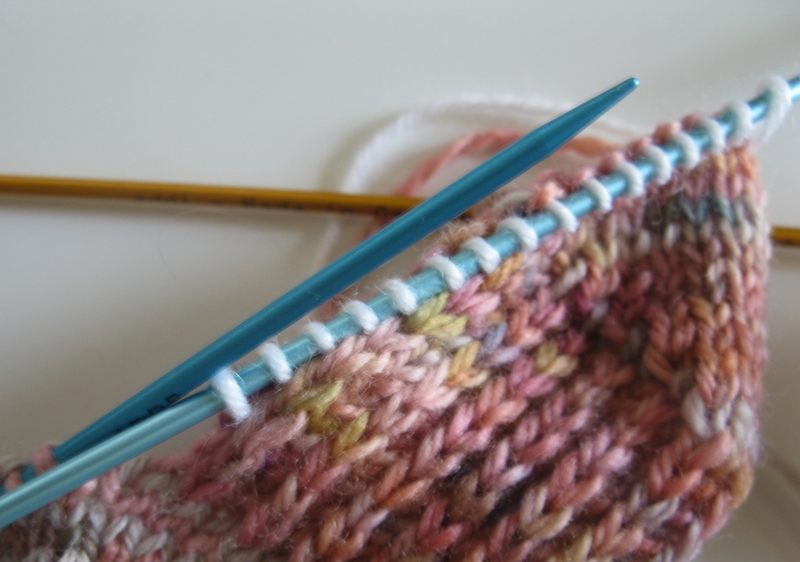 When you have knit the stitches of the top of the foot, it is time to pick up the stitches for the gusset on the other side of the heel flap. 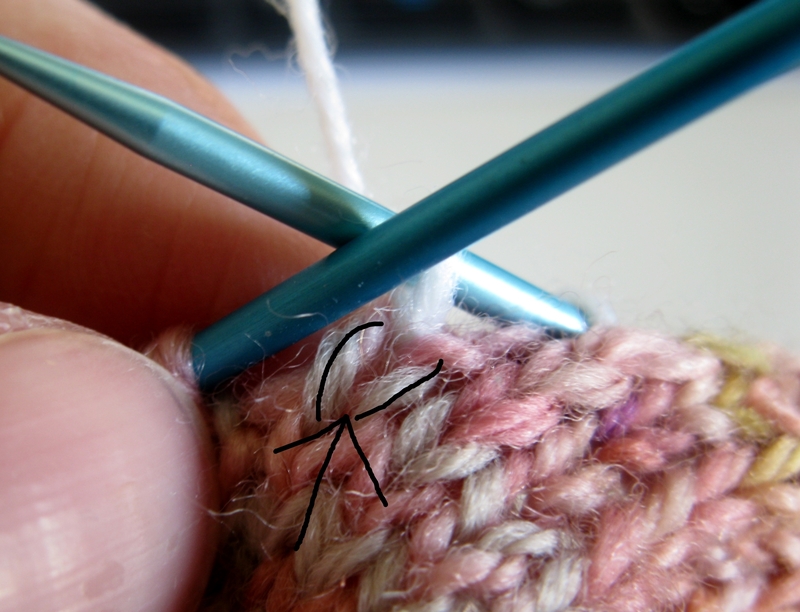 Look for the corresponding stitch on this side and pick up there, not in the first selvedge stitch. See? 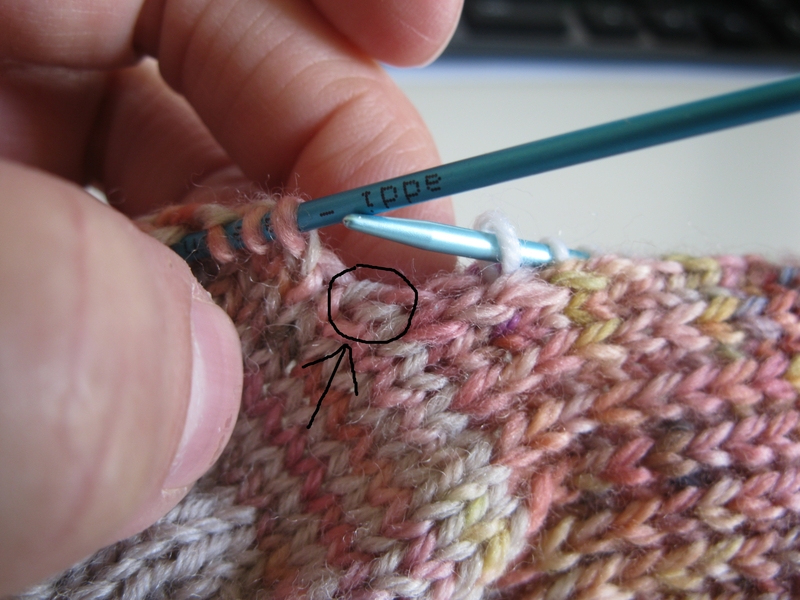 The arrow shows the little gap that is made by skipping the first selvedge stitch. When you are done that, you pick up the rest of your stitches as you would. This way, there will be virtually no holes between the the heel flap and top of the sock, and the slightly larger gaps are closed neatly on the next row. This is how I do it! Dear non-sock-knitters, please forgive the lack of information for you today, yet this is something I have wanted to share for a while. This isn’t cheating…. it is “perfecting your technique”! I do this as well but not as neatly. Thanks for the tip… Would you use the same process for the underarm of a sweater? The underarm of a sweater is a bit of a different animal – so to speak. picked up stitches and the rest, so I just tighten those up when weaving in the end. 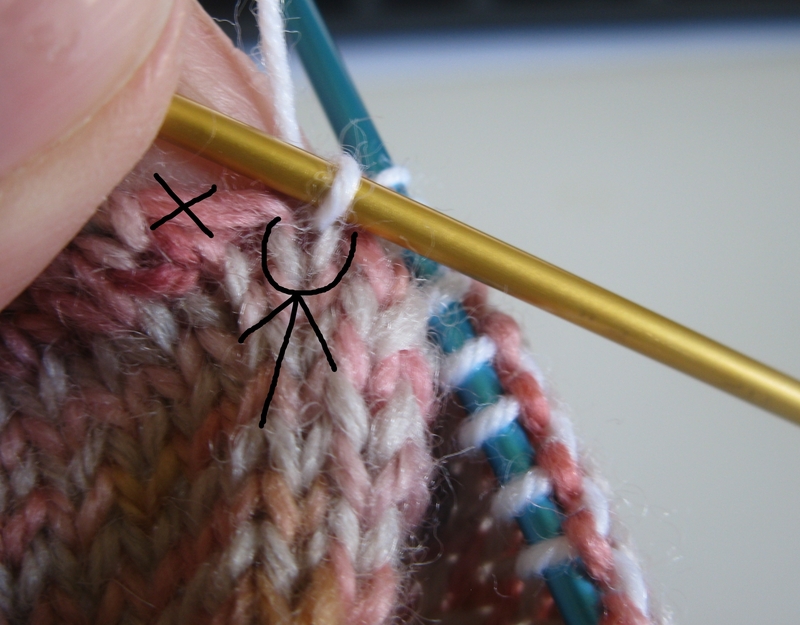 I pick up into the ‘V’ of the stitch. Then it looks like uninterrupted knitting and it closes the little gap that can appear nicely. That’s a very good tip, thanks so much.. I pick up all the gusset stitches, plus one extra where the hole would be, then knit the hole stitch & the first (or last) gusset stitch together on the next round. Yes – that is another possibility of avoiding holes. There are plenty of variations of this out there, thank you for mentioning this one! This is what I do – by instinct. So reassuring to know that you do it too – I always felt I was cheating … now I feel that I am ‘being clever’ Thank you for encouragement! It is always nice to know that we are not alone in what we are doing! Knit on! Thx for the input I like this way better than mine. Thx a lot for this, I’m gona tray it next time!